I don't have to have the gold. So pretty. Great thrifty find. So cool. Great thrift here. Totally a classic. I like that cheaper price, too. They are pretty similar and with that much price difference, I would definitely go for the cheaper ones. Great wedges! I think I'm starting to like them more than heels; so much more comfy! Def the Steve Madden version! They look pretty identical, but I'd have to take a pass on these ... Those wedges are too tall for me to tackle! Gorgeous wedges! Steve Madden always gives such great knockoffs haha. I like the Louboutins better. I'm not crazy about gold buckles on the Maddens. But I can't afford them, so I guess I'm out of luck! The Loboutins are pretty, but I don't think I'd ever buy wedges from them. 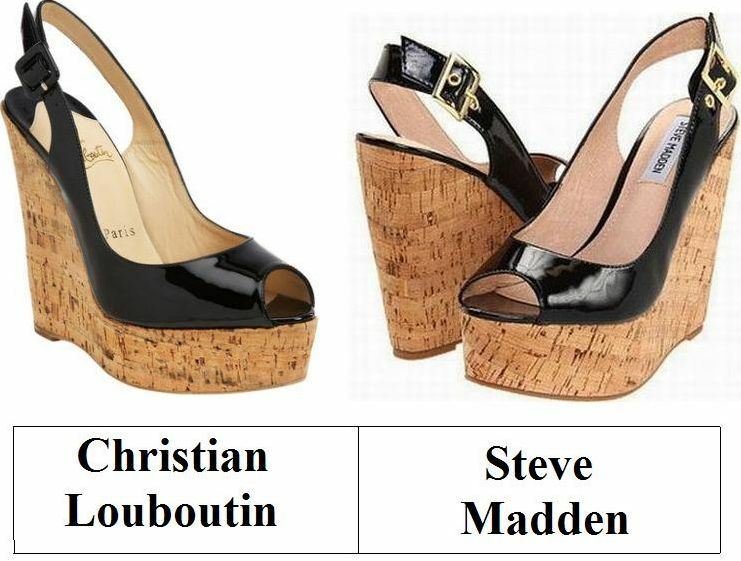 I'd rather stick with the Steve Maddens because they're higher and I love almost everything Steve Madden. Steve Madden all the way! woah, these are so similar! the steve madden ones are a score! need to find them! now this is a super hot deal. love those steve maddens! So cute -- love the Steve Maddens! Definitely the Steve Madden's! I think those would be so cute for summer. I've always wanted a pair of Louboutins, but they're definitely out of my price range, so I'm sticking to Steve Maddens! Love it that you found these! What a thrifty alternative. Those are cute!! Pretty good match at that price point, too. Not that I wouldn't want a pair of Louboutins but at that price I am staying with my Steve Madden, that I've been so 'hook on' lately and love how they fit. BTW you post the best wedges here. I love the cork heel. Incredibly similar and well done you for a great find! Just came over from Mary Jos' Trust Your Style, Jody here nice to meet you..
Great comparison! I love them both! Have a nice week, honey! I must say I am so addicted to Louboutin. for sure steve madden this round.